At the office of Dr. Charles C. Harrington, our mission is simple: help our patients achieve a healthy, beautiful smile through convenient orthodontic treatment. As a leading orthodontist serving the Gaithersburg, North Potomac, and Kentlands, MD area, we're proud to provide a wide range of orthodontic treatment options to patients of all ages. While our most popular treatment is traditional metal braces, Invisalign offers an exciting alternative for patients seeking discreet orthodontic care. Almost Invisible: Invisalign aligners are clear and lay flat against the teeth, making it nearly impossible to see them when worn. This means Invisalign won't show up in pictures, presentations, or other important events. No Dietary Restrictions: While wearing braces, patients have to avoid certain foods – but Invisalign aligners come out when you eat, so you can still enjoy the foods you love. Simple Oral Hygiene: Maintaining oral hygiene with braces requires the use of special tools like floss threaders, but with Invisalign, you simply remove the aligners and clean your teeth as normal. Improved Comfort: Braces have metal hooks and knobs that can cause tiny cuts and scratches in the mouth, often causing minor discomfort for patients. Smooth Invisalign aligners won't irritate your mouth, making for a more comfortable treatment option. Treatment by a Master: Dr. Harrington has completed the Invisalign Masters Program, making him uniquely qualified to provide Invisalign treatment. You can rest assured you’re getting the best smile possible! First, we'll bring you in for an initial consultation appointment. At this visit, we'll perform a detailed orthodontic evaluation, diagnose any orthodontic problems we find, and create high-fidelity digital impressions of your teeth without using dental putty. We'll use these diagnostic procedures to construct a 3D model of your teeth and bit. Based on this model, we'll create a detailed treatment plan and break it into 2-week increments. 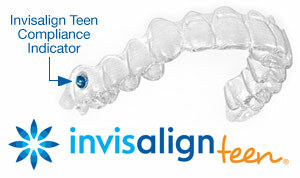 Based on these increments, we'll have the Invisalign company custom-manufacture your own set of Invisalign aligners. Once you start treatment, you'll wear your aligners for 22 hours a day, taking them out only to eat drink, brush, and floss. You'll switch to a new pair of aligners every two weeks. Once you finish your last pair of aligners, your new smile is ready to stay with you for a lifetime! Eruption Tabs: Invisalign Teen aligners can be made with special eruption tabs, which hold space for unerupted teeth in the mouth. Blue Dot Wear Indicators: Invisalign Teen aligners also come with built-in compliance indicators that fade with use, telling teens, parents, and doctors if the aligners are being worn enough or if the patient needs to be a little more diligent. Free Replacements: Every course of Invisalign Teen comes with six replacement aligners included free of charge, so there's no need to worry if any get lost or broken. During treatment, proper oral hygiene is vital to protecting your smile and ensuring your treatment goes smoothly. You'll need to floss daily and brush at least twice a day, but it's critical that you brush your teeth anytime after you eat or drink. You'll also have to brush your aligners whenever you remove them from your mouth, and soak them in a glass of water with a denture cleaning tablet periodically for a deeper clean. Proper hygiene is important for preventing tooth decay during treatment and safeguarding your new smile. Once your treatment ends, we'll create a clear retainer for you and give you detailed instructions on how to wear and care for it. Wearing your retainer is vital for preventing your teeth from drifting back to old positions, safeguarding your smile for a lifetime. If you're ready to take control of your life and achieve the smile you've always been dreaming of, we would love to help you get there. Call us today at 301-977-1441 or use our easy online form to request a consultation online at our North Potomac, MD office. We can't wait to hear from you, and we're excited to help you achieve a gorgeous new smile through convenient Invisalign treatment!